First published on Irish Country Living. Ten years ago, the Kiwi turned 30. The night beforehand, we booked a corner in a pub on Wexford Street in Dublin, just 20 minutes’ walk from where we lived then. Friends gathered. There were plenty of pints – not craft beer in those days! – along with a stack of his favourite dark, rich cocoa brownies that I’d made, studded with walnuts and illuminated with candles. The following morning, I poured him into a car and we drove to Kildorrery in North Cork where – within the space of half a day – we viewed, fell in love with and promptly bought our little cottage in the country. I was never going to be able to top that for his 40th! Instead, we invited four friends and their kids to come and camp in the back garden of the cottage with our two girls. We had a campfire, cooked sausages on sticks, toasted marshmallows and sandwiched them between digestive biscuits and, as the children eventually sank into a sticky, blissed out, sugar coma we drank our own, made-just-down-the-road beer. Ten years. A lot changes. And some things stay the same. Those friends had been out in Dublin with us for the Kiwi’s 30th. They remembered the brownies. So did I. We didn’t share them with the kids. These are real store-cupboard favourites that I’ve made all my baking life. You might not be fan of walnuts but – I promise you! 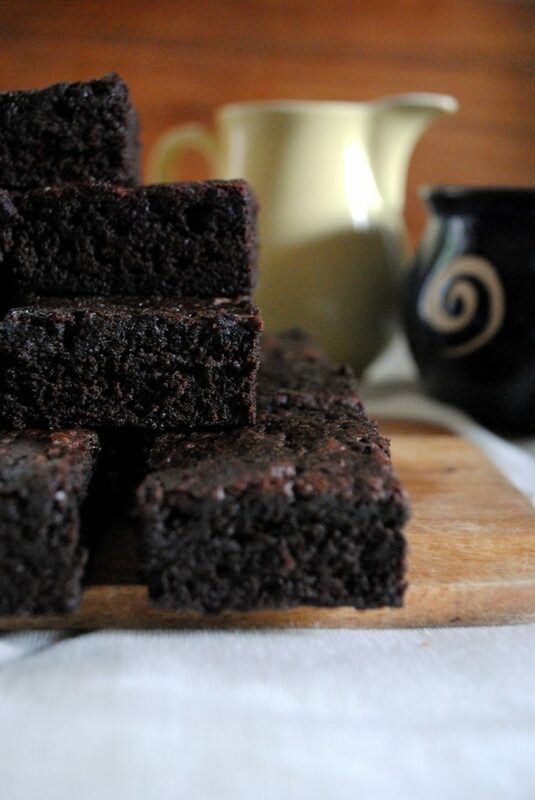 – they give the brownies a great texture and flavour. I often toast the walnuts in the preheating oven; just spread them on a baking tray and keep a close eye so that they don’t get too dark. Makes 24 brownies. Preheat the oven to 180°C (160°C fanbake) and line a shallow 2 x 25 x 3ocm Swiss roll tin with greaseproof paper. Sift the flour, cocoa, baking powder and salt together. Melt the butter in a large saucepan and allow to cool. Add the caster sugar and vanilla essence and stir thoroughly. Mix the eggs into the batter, then gently stir in the sifted or whisked dry ingredients. Stir in the walnuts. Pour into the prepared tin and bake for 20-23 minutes until the brownies are just set in the middle. Don’t overbake these! Best taken from the oven when your testing toothpick comes out with a couple of crumbs clinging to it. Cool on a rack before cutting into 24 squares. Store in an airtight tin.